This is Tony Kasabasich’s Just Aircraft Summit. There were 10 kits built, as these were the first kits Just Aircraft ever produced. Only 3 ever flew, and there are only 2 still flying. The others were probably completed, but registered as something else. 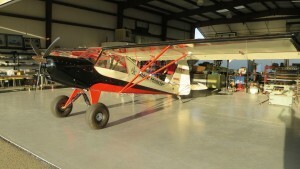 Just Aircraft also build the Escapade, which was replaced by the Highlander. The Summit was replaced by the Super STOL. It’s a tandem seat, and this one was built by the factory. Tony’s flown with an 80lb sack of sand, but he’s looking for a passenger no more than 5’8″ tall, and less than 125lbs to cram into the back. There are no controls in the back, so you can only fly it from the front seat. 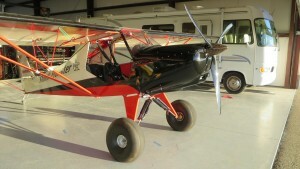 It’s currently running an 80hp Rotax 912UL, but he has plans to put in the hop up parts to make it 105hp. The wings fold up, but the flaps interfere with each other, so it’s not as towable as he’d thought. 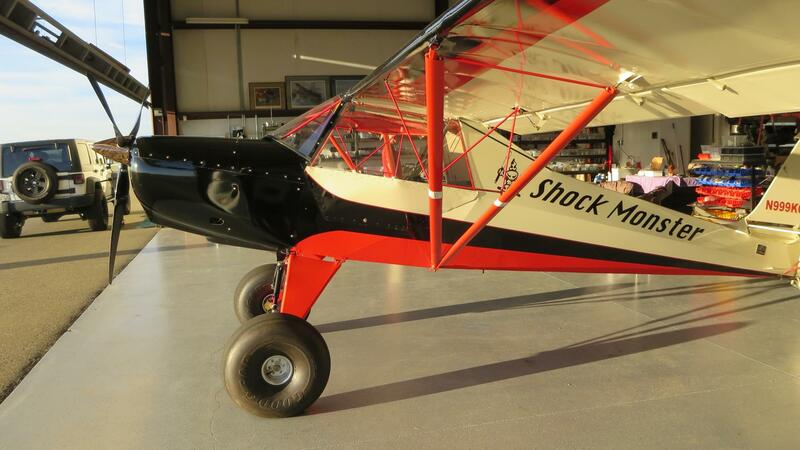 Tony runs Shock Monster, so this is kind of a flying test bed for his STOL shocks. He can land at around 1000′ per minute with no flare whatsoever, and tends to land with the main wheels, rather than worry about the tailwheel in a 3 point landing. He’ll approach on a 3/4 mile final just above stall, and drop it onto the 27″ tires. It has dual piston disc brakes, so stopping it isn’t a problem. He’s recently switched all the lights to LEDs, including the landing lights. Everything is built as light as possible, so it weighs 545lbs empty, and is rated for 1250lbs gross. The stall speed is listed as 28mph, but he’s had it down to the high teens – it flies very poorly at that speed though. It’ll cruise at about 95mph (at around 3.5gph), and can get up to around 105mph. He’s running avgas because it’s easier to get at airfields. It has 18 gallons of gas, so it has over 4 hours’ range. 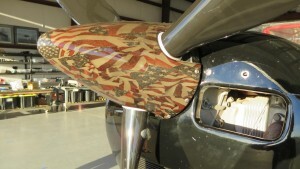 It has analog gauges, and Tony uses an iPad with Foreflight as a nod to modernity. He has no plans to upgrade the panel with all the latest gizmos. The tail tends to stop flying before the wings do, so he has plans to work with some vortex generators to try and improve this, and add a leading edge strip to make the wing fly a little better.